Manchester City is interested in Dragan Georgiev, the 17-year-old talented striker, member of the 2nd league club Turnovo and regular member of the Macedonian U19 national team. Many big European clubs, managers and scouts followed the Macedonian talent in the past months and now Manchester City have officially declared their interest. In a statement for the Macedonian daily sports newspaper "Makedonski Sport", Turnovo's president Orce Todorov confirmed the interest from the English side and the invitation for Dragan Georgiev to attend one of City's football camps where Sven Gorran Eriksson and his assistants will be able to see his qualities. Dragan Georgiev is born on 16/12/1990. He is the best player and striker in his club Turnovo and is one of the main reasons for Turnovo's big chances for winning a promotion to the Macedonian First League. 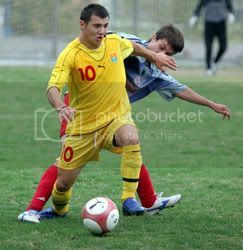 Georgiev is regular member of the Macedonian U19 national team and with his good performances on the international matches he drew the attention of many scouts and managers.